Build your brand, trust, and get more visibility and credibility. Having presence in both organic and paid search results increases your brand’s trust subconsciously. One advantage of having brand terms in the keyword list of paid search campaigns is that it boosts AdWords account quality score. Branded keywords in general have higher quality scores that are beneficial for campaign performance. 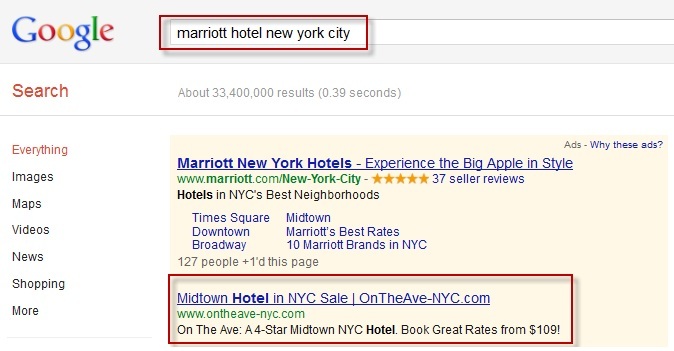 When we add new keywords to the AdWords account, Google instantly assigns a quality score. Basically, it uses historical performance of all keywords in the account for assigning the quality score. Quality score is one of the most important factors that determine your ad position and cost per click. Therefore, the higher the quality score, the higher the ad position and the lower the cost per click! Advertise for the users who are looking for your hotel. If you don’t advertise or bid on your own brand, your competitors will get the advantage. Bid on your brand terms and make sure you are present where your customers are. Today, competitors are bidding on your brand’s keywords, distracting your customers, and may be gaining your market share. So is it a good idea to only rely on organic search results? With a paid search ad, you can help customers reach the most relevant landing page on the website and not let Google or other search engines decide where your customers land. For example: If your hotel is running a Romantic package for Valentine’s Day, you can easily direct the users searching for Valentine day package to the Romantic package page on the website. A company’s home page/about us page may not be the most relevant; however, it can still appear on the top of the organic search results, before the actual package page. In addition, further explore different areas where your customers are and what they’re looking for. When we bid on broad match branded keywords, Google contextually matches your ad to the search queries that it thinks is relevant. This gives you an opportunity to find new keywords for organic search optimization as well. For example if you see a trend that people frequently search for a particular restaurant within your hotel for which you do not rank organically, then it’s time to create web content for your restaurant. This is an opportunity for you to capture traffic that is looking for this restaurant and thus target new customers that you would have missed without running brand ads. In summary, a paid search ad gives you flexibility to advertise new offers, discounts, packages, etc. You can test different branding messages in your ad quickly without waiting for your website to get re-indexed by search engines. You have control on where you direct users on the website, what action you would like them to perform (example purchase a product, book a hotel room, sign up for newsletter), and most importantly you can define a start and end date to your ads.